Sometime back I tried my hands at making Jalebi. Now I always had an idea that it would be very tough to prepare it . But it was quite easy and I was surprised at the results. Though I struggled a bit to get the shapes right, the taste was awesome. I paired it with rabdi or 'thickened milk' which is a classic combination in North India. The creamy chilled rabdi goes very well with the crunchy hot jalebis. Though it takes a bit of time to get both ready, one can make the rabdi a day or two in advance to save oneself from too much trouble within the span of a single day. Preparation - Soak the saffron strands in warm milk for 20 mins. Rub with you fingers. Add to a mixing bowl along with the rest of the ingredients ( except baking powder ) listed under 'For the jalebi'. Add a little water at a time and mix using a hand blender. The consistency should be thick . Allow to ferment overnight or still more in a cold climate . The baking powder goes in 20 mins before the jalebis are made. Cooking - Heat the water and sugar in a saucepan for making the sugar syrup. Boil for 8-10 mins or till 1 string consistency is reached. Add the food color and saffron. Keep aside and ensure that it stays warm to touch. Heat oil in a shallow vessel. 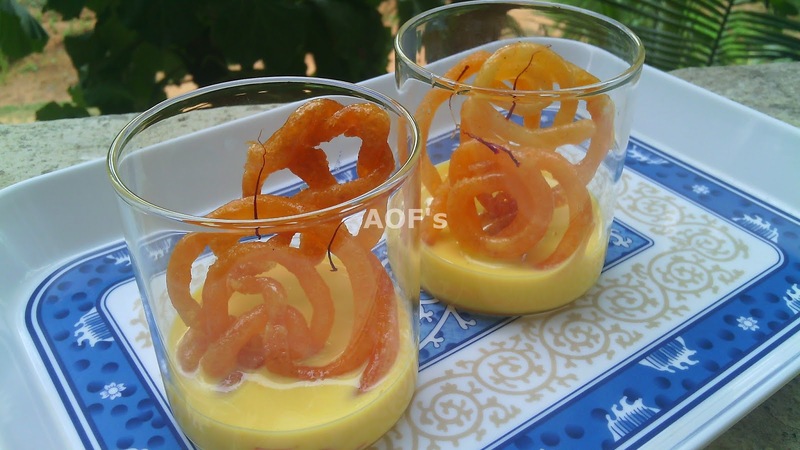 Take the jalebi batter in a piping bag or a cloth with a small hole in the center. Holding the tip just above the oil, pipe out into circular shapes starting from center, make 2-3 circles (or more if you can manage) and close the end at the last circle. Apply uniform pressure while piping the batter. Fry on medium heat on both sides till golden and crisp. Transfer from the hot oil straight to the warm sugar syrup. Allow to soak for 1-2 mins before removing it to a plate. 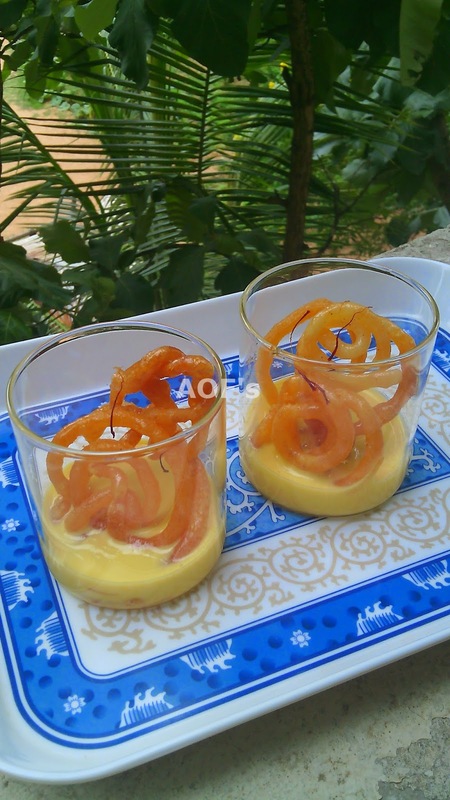 Pour out the chilled rabdi into pint sized glasses and place the warm jalebis over it. Garnish with a few saffron strands and nuts if desired. Serve immediately. nothing can be more tasty and yummy..awesome combo! My mouth is watering here, tempting and fabulous combo. Such a great dessert...the combo is heavenly!! !